IMD IPD mind meld: Art for arts sake? Named after the Maison de l'Art Nouveau an interior design gallery in Paris 1896, Art Nouveau infact had many different names throughout Europe, in Germany it was known as "Judgendstil" a name taken after a "youth" magazine, in Italy "Stile Liberty" it was the "Modern Style" - a modern take on decorative art. It began in the 1890's when artisits and designers alike where reaching out for inspiration, whilst also experimenting with new materials and techniques from all around the world in an attempt to unify the vision of design. In an age of innovation Art Nouveau reflected the changes in our everyday lives, the introduction of modern conveniences like the car the telephone even the role of women was changing and the new art challanged this the emphasis was more than ever before on the indivdual - a bit like our morals today! In Britain the sytle was never more apparent in the design works of Charles Rennie MacKintosh and the work of the Macdonald sisters. Their influences from Celtic art, the Pre-Raphaelites and Japan often led to a spooky almost over the top design a bit like the works of Gaudi in Barcelona one of my favourite Designers has work draws you in like a world away from the real world it also reminds me of the house in Casper the movie you just wish you where there when you see pictures of his work anyway.. The Japanese influence in Art Nouveau was something i had never noticed but when you look at the prints from japan and the works of Charles Rennie MacKintosh it becomes obviuos and you wonder why it wasn't there before. Art Nouveau reached its peak in the 1890's when the economy of Europe and Amercia was at its best it was a style that represented natures influence in design and how the things we take for granted are often the best design inspiration. 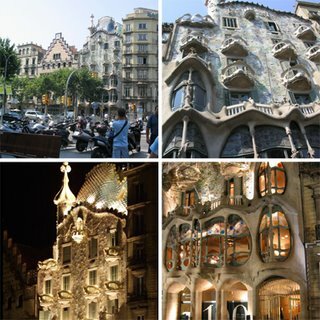 It was an international style that still captures the eyes of thousand today just a trip to Paris often named the city of Art Nouveau but for me it has to be the works of Antoni Gaudi that catch me imagination and show how captivating design really can be.